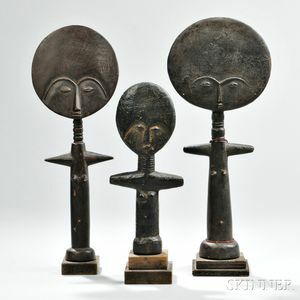 Three Ashanti Female Fertility Dolls, Ghana, all with stylized forms and disk-shaped heads, one decorated on the back of the head with relief-carved pictographs of a tree, leaf, and comb device, ht. to 13 1/2 in. Provenance: Ladislas Segy Gallery; Skinner, Lot 29, November 12, 1988.